Three hundred nautical miles from shore, I‘m cold and sick and afraid. I pray for reprieve. I long for solid ground. And I can‘t help but ask myself, What the hell was I thinking? When Sue Williams set sail for the North Atlantic, it wasn’t a mid-life crisis. She had no affinity for the sea. And she didn’t have an adventure-seeking bone in her body. In the wake of a perfect storm of personal events, it suddenly became clear: her sons were adults now; they needed freedom to figure things out for themselves; she had to get out of their way. And it was now or never for her husband, David, to realize his dream to cross an ocean. So she’d go too. Ready to Come About is the story of a mother’s improbable adventure on the high seas and her profound journey within, through which she grew to believe that there is no gift more precious than the liberty to chart one’s own course, and that risk is a good thing … sometimes, at least. 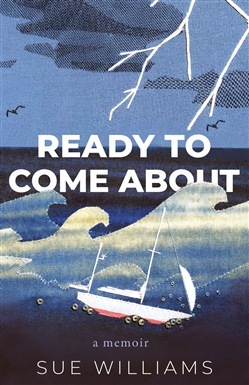 Acquista Ready to Come About in Epub: dopo aver letto l’ebook Ready to Come About di Sue Williams ti invitiamo a lasciarci una Recensione qui sotto: sarà utile agli utenti che non abbiano ancora letto questo libro e che vogliano avere delle opinioni altrui. L’opinione su di un libro è molto soggettiva e per questo leggere eventuali recensioni negative non ci dovrà frenare dall’acquisto, anzi dovrà spingerci ad acquistare il libro in fretta per poter dire la nostra ed eventualmente smentire quanto commentato da altri, contribuendo ad arricchire più possibile i commenti e dare sempre più spunti di confronto al pubblico online.